U.S. Flag Store's District of Columbia Flag is printed in America on Nylon flag fabric. Since this flag is made in America, U.S. Flag Store is able to ensure that the complex State emblems are printed with accuracy, sharp detail and bright colors. This outdoor District of Columbia State Flag is finished with the same high quality materials as all of U.S. Flag Store's US flags, and is extremely durable and long lasting. Design: A flag with a white base and two equally sized red stripes that run across the flag horizontally. Above the stripes are three five-pointed red stars of equal size. Meaning: Based on George Washington's family coat of arms. Over 100 years after the founding of the District of Columbia, the capitol of The United States of America was still without an official flag. The District of Columbia flew several unofficial flags and used flags from US organizations like the National Guard. Finally, in 1938 the U.S. Congress formed a commission to choose an official flag for Washington, D.C. The commission announced a public competition for the design of the flag and received many entries from all over the country. The commission ended up picking the design of Charles A.R. Dunn, who had first submitted a design for the flag in 1921. Dunn hated the state flags that simply featured a state seal or emblem, but loved the state flags like that honored the laws of heraldry. One such flag was Maryland's which get its design from the coat of arms of Lord Baltimore. This gave Dunn the idea to use George Washington's family coat of arms in a flag as well. 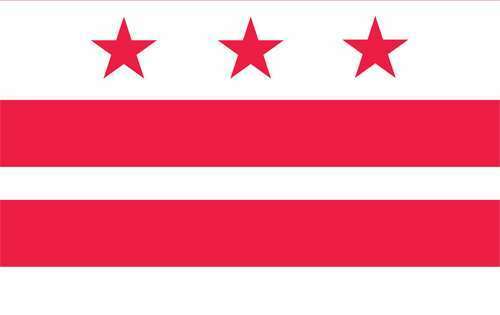 Dunn's design was officially made the District of Columbia flag on October 15th, 1938 and has remained the capitol city's official flag ever since. In a 2004 poll on the North American Vexillological Association website, D.C.'s flag was voted the best design among all United States city flag.